Stainless Steel Outer Wall, PP Plastic Inner. Matt Black with Color accents on lid. 18 oz. when filled to the rim. 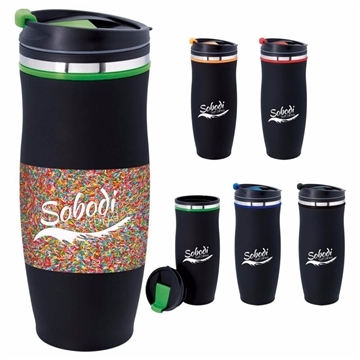 Keeps drinks hot and cold for hours. Material: Stainless Steel, PP Plastic. Overall Reviews: WRITE A REVIEW (0) Charles Tumbler - 18 oz.